Bob Andy (born Keith Anderson) emerged as a solo star in 1966 with the smash hit “I’ve Got to Go Back Home”, a song which has become a much-loved anthem for Jamaicans. He had served his singing and songwriting apprenticeship with the legendary vocal group The Paragons, which he founded with Tyrone (Don) Evans and Howard Barrett, later joined by John Holt. The Paragons had several hits for producer Coxsone Dodd including the Number One “Love At Last”, penned by Bob. As one of Studio One’s leading lights, Bob worked closely with Jackie Mittoo on many of the label’s seminal sounds. Besides writing songs for himself which have become reggae standards – “Feeling Soul”, “My Time”, “Going Home”, and “Too Experienced”, to name just a few – Bob contributed hits for many of the other artists there. Bob Andy In 1970, international recognition came when Bob and Marcia Griffiths recorded Nina Simone’s “Young, Gifted and Black”, which sold 1/2 million in the UK and Europe, and still receives frequent airplay today. BOB & MARCIA became household names, appearing on Top of the Pops and touring extensively. They had another UK Top Ten single and two albums for Trojan Records. During the early 70s Bob continued his solo recordings; “You Don’t Know” and “Life” are two songs from this time which hold a special place in the hearts of his British fans. After the duo split in 1974, Marcia became one of Bob Marley’s I-Threes, and Bob’s singles “Fire Burning” and “Check It Out” struck a responsive chord with Jamaicans in the new social consciousness of the Manley era. In the middle Seventies Bob was the Tropical Soundtracs label’s A&R manager. He and Marcia reunited for the Kemar LP, which remains the definitive Bob & Marcia album and has been released as Really Together on Bob’s own label. Bob was one of the first Jamaican artists to establish his own publishing company, ANDISONGS, and served as one of the prime movers in the attempt to establish a Caribbean Copyright Organisation. 1978 saw the release of Bob’s album Lots of Love and I, which amongst many excellent tracks contains the classics “Ghetto Stays in the Mind” and “Feel the Feeling.” In the same year he traveled to Cuba to perform at the 11th World Festival of Youth and Students. Then began a five year absence from the music scene as Bob became increasingly involved in acting. He took lead roles in several theatre productions, and in 1979 starred in the Jamaican feature film Children of Babylon. In 1983 Bob was welcomed back to the reggae charts with a Number One single, “Honey”, followed by a Number One album, Friends. For these and subsequent releases he formed his own label, I-ANKA, in Jamaica and the UK. During 1985 Bob toured California, appeared at the Youth Festival in Moscow, and headlined the first Japanese Reggae Sunsplash. The Retrospective album was released in 1986 (1987 on Heartbeat / Rounder Records in North America) to widespread critical acclaim. It provides a missing historical link between the Studio One masterpiece Bob Andy’s Songbook and his more recent work. In November 1987, Bob assumed the post of A&R and Promotions Director for Tuff Gong (the group of companies founded by Bob Marley). In this capacity he represented Tuff Gong Music at many industry functions in Jamaica and abroad. He produced music by such artists as Nadine Sutherland, Ernest Wilson and Tyrone Taylor, as well as new talent. Bob’s stay at Tuff Gong provided him with many opportunities to express his life-long desire for higher standards in Jamaican music, both in its business operations and in the quality of its musical output. Bob Andy Freely, released on I-Anka in late 1988, comprised tracks recorded throughout the middle 80s. It received rave reviews and spent many months in the reggae charts. 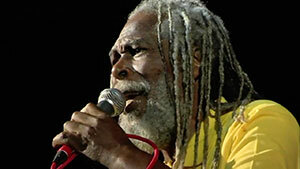 Assuming once again his role of Jamaican music pioneer, Bob spent six months in Australia in 1989, conducting workshops and playing with local musicians. On December 13th 1989, he joined other leading reggae artists at Gdansk Shipyard in Poland in an Anti-Apartheid concert sponsored by Solidarity to celebrate the progress of the world’s liberation movements. The 90s and the first years of the new millennium have found Bob continuing to give stunning performances in Europe, Japan, Jamaica, Canada and the US. In addition to his solo performances he has taken part in a series of special reunion concerts with Marcia Griffiths. In early 2005, Bob made his first journey to Africa. He performed at the Bob Marley 60th birthday concert in Addis Ababa to an audience of several hundred thousand, and also sang at the Ethiopian President’s Palace. During a visit to Shashemane in the weeks following, he gave benefit concerts for the 12 Tribes. The 21st century has seen Bob adding new classics to his repertoire, such as the well-received singles “Zion”, “There Is A God” and “Ska Music (is Jah Music)”. There have been two successful singles voiced for the Altafaan label: “Create Our History” with Luciano, and “Almighty Dolla”, as well as a new composition, “Constellation”, written for the Dominican opera singer Marie-Claire Giraud. Bob’s single “Send Someone for Me (I’m Coming Home)” was recorded with one of Jamaica’s rising young bands, Raging Fyah in 2012. Further collaboration with Willie Lindo in 2013 has resulted in the heartfelt “Love Is Sure”; and the current release “Mama Africa”, a co-production with Purple Lion, is Bob’s tribute to the continent of his ancestors. Jamaica conferred its Order of Distinction in the rank of Commander (CD) on Keith ‘Bob Andy’ Anderson in October 2006 for his contributions to the development of reggae music. For Bob’s birthday in October 2011, the Jamaican musical community honoured him with a tribute concert, “Bob Andy Unplugged”. During this event more than 75 leading artistes, musicians and arrangers collaborated to perform selections from his catalogue.